More than two million American servicemen and women passed through Britain during World War Two. Many were based here with the United States Army Air Forces (USAAF), most of them living in eastern England. To mark the reopening of the American Air Museum at Imperial War Museum (IWM) Duxford, photographs of some of those men and women are to be shown alongside some of the aircraft that flew at the time. The pictures are drawn from the Roger Freeman Collection, which IWM acquired for the nation in 2012. Here we present a selection of the stories of those who found themselves on the other side of the Atlantic fighting against Nazi Germany. As bombardier, Erickson's job was to release bombs accurately over the target, using the Norden bombsight device. The Norden helped the bombardier to make complex calculations, but it needed near-perfect conditions to work, including good weather, which proved elusive. The son of a train driver from Mankato, Minnesota, Erickson completed only eight missions. In October 1942, his friend Lt Ben Rushing recorded in his journal: "Erickson was lost. He went in someone else's plane and happened to [have] hard luck. "You begin to realise that it is war when they get your best buddies. I can hardly realise that he is definitely lost. May his soul rest in peace." However, Erickson did not die. He was captured and was a prisoner of war for nearly three years. 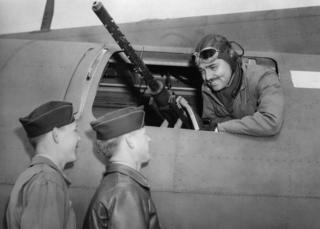 Hollywood star Clark Gable was stationed in Polebrook, Northamptonshire, in April 1943 with a film crew where he produced and directed the film Combat America, which focused on the experience of aerial gunners. 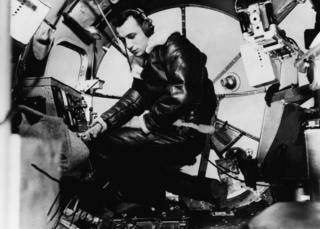 He flew on five missions in order to make the film before returning home to edit. The film was completed in 1944 and Kenneth Huls and Phil Hulse, seen with Gable here, are featured in the film. Wright belonged to the Ninth Air Force, which, following the ground invasion of France in June 1944, moved its bases from Britain to mainland Europe in order to provide closer support to the advancing troops. This picture was taken near St Trond, Belgium. It was not the first time Wright's aircraft had been hit on a mission. By the time this photograph was taken, the 19-year-old had completed 39 missions and survived being hit by flak six times. Wright was considered a very fortunate man by his squadron, who nicknamed him Lucky for his ability to evade death. The hole here measured eight inches in diameter in an 11-inch propeller. If the damage had been an inch and a half over on either side, the blade would have severed and Wright would have been brought down. Wright died, aged 34, from lung cancer. Virgina Irwin joined the St Louis Post-Dispatch newspaper in 1932. 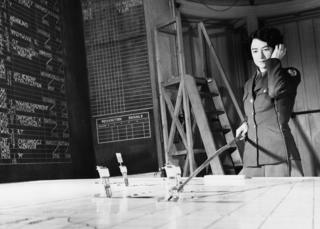 Her request to be sent abroad to cover the war was denied, but in 1943 she volunteered to work for the Red Cross on an air base in the UK. Just before D-Day, Irwin's paper changed its mind. Conveniently close to the action, she was accredited as an official war correspondent and reported on progress in 1944 and 1945 as the Allies pushed east towards Germany. This photograph was taken during an interview with Moran, a fighter ace who would continue his air force career in Korea and during the Cold War, retiring as a brigadier general. There is a bridge named after him in Missouri. The scoop of Irwin's career came when she and another journalist drove through Russian lines to Berlin, arriving on 27 April 1945. It was three days before Hitler's suicide and the city was in chaos. Held back until Germany's official surrender, her stories later became headline news. Irwin was awarded a year's salary as a bonus, but on returning home she was assigned back to the features department. She never succeeded in breaking into the all-male newsroom. Leo Teetman was born in Brooklyn, New York, and joined up in 1942. 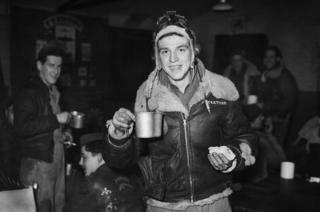 He was assigned as a gunner to the 384th Bomb Group, based at Grafton Underwood in Northamptonshire. 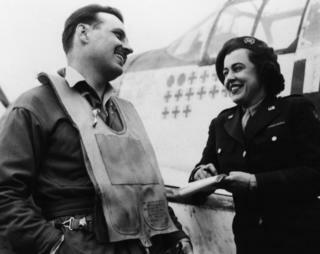 Teetman completed 25 missions in the early stage of the bombing campaign, when the Eighth Air Force's focus was on occupied Europe. This photograph was taken after returning from an attempt to target a ship in the mouth of the Garonne River in southern France. The weather was terrible and forced several of the bombers to land away from home. In this picture, Teetman is at Kimbolton, Cambridgeshire, an airfield that lies around 20 miles from his own base. It was his first mission, and he was 20 years old. Teetman settled in Connecticut, where he worked for a company making optical instruments. He married and had three children. Barbara O'Brien enlisted in Dallas, Texas, in December 1942. This photograph was taken a year later; she was part of a Women's Army Corps unit based at Marks Hall, Essex, which had taken over from the British WAAF the duties of plotting, typing and stenography. O'Brien worked as a plotter and moved with her unit to France, and finally to Bad Kissingen in Germany. As a talented artist, she was in demand with the flyboys to add nose art to their aircraft. 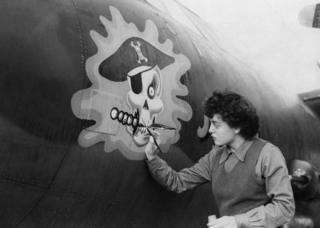 The one she is painting here, the Jolly Roger, belonged to the 323rd Bomb Group, based at nearby Earls Colne in Essex. After the war she attended art school in San Miguel de Allende, Mexico. It was there she met her husband of 51 years, Frank Kuzel, who was himself a veteran - he had been part of the 101st Airborne Division and a prisoner of war in Germany. They later returned to the US and brought up two sons in Dallas, both of whom served in the military. Margaret Scott married Cpl Milton Holley of the 401st Bomb Group, based at Deenethorpe in Northamptonshire. Ten months after their marriage, she sailed for New York with 520 other GI brides (and one GI baby) on SS President Tyler. 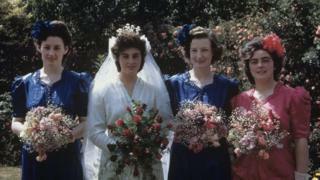 It was a huge step for the approximately 40,000 women who left the UK to make new lives in America, and not all war bride stories ended happily. Many had known their husbands for only a short time before they were sent back to America, and the relationships did not last. Sometimes the husbands got cold feet, and did not come to meet their wives when they arrived. Happily, Milton and Margaret's marriage lasted for the rest of their lives. They settled in Michigan and raised a family, living in the house they built. 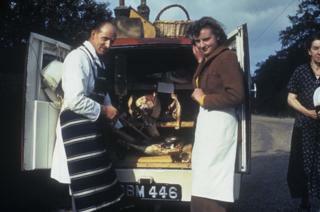 Milton died in 2000 and Margaret passed away in 2002, aged 86. 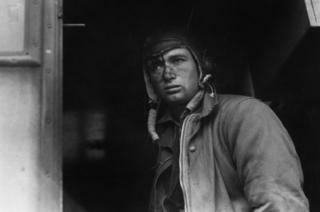 Image caption Houck dons his devil's helmet prior to a mission. Louis Houck, from North Carolina, enlisted in July 1940 and served as a pilot with the 365th Fighter Group of the Ninth Air Force, also known as the Hell Hawks. He was commander of the 387th Squadron from May 1943 until October 1944. 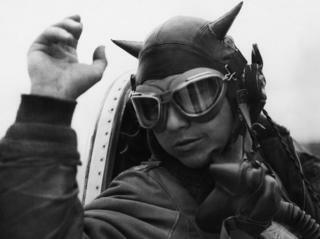 Houck wore his customised devil's helmet on missions over Europe, flying his P-47, Screamin' Weemie. 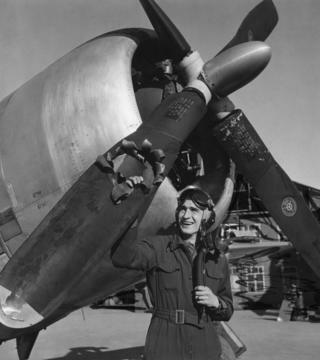 The nose art of his plane depicted a demon brandishing a pitchfork. Despite his extravagant appearance he was described by a group member as quiet, introverted and respected. In 1944 Houck was responsible for almost entirely destroying a retreating German convoy in France. The convoy had been transporting gasoline and ammunition and its smoking wreckage was captured on camera shortly afterwards. From Branchport, New York, Smart enlisted in August 1942. He was 20 years old and already married, to Arlene. The day this photograph was taken, Smart had flown as a waist gunner on the B-17, Big Bust, on a mission to the Ruhr Valley in Germany. This was the first daylight operation to the Ruhr, which had acquired the grimly humorous moniker Happy Valley due to the scale of German defences that protected its heavy industry. The bombers flew unescorted by fighter aircraft, and were badly scattered en route. Enemy fighter opposition and flak damaged 15 of the 20 bombers from the 305th Bomb Group. Ten other men from the group were wounded and a further 10 were missing in action. In all, 83 men from the formation were killed in action. 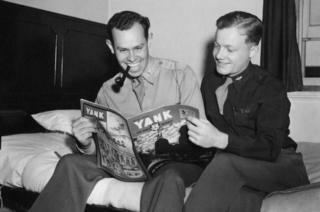 Image caption Lt George Hartman (left) and Lt Robert Belliveau read Yank: the Army Weekly at Duxford, August 1943. Both George Hartman and Robert Belliveau were pilots with the 78th Fighter Group which flew out of Duxford in Cambridgeshire, primarily in P-47 Thunderbolts. For the last few months of the war the P-47s were replaced by P-51 Mustangs, which had a longer range. Belliveau flew 96 missions and survived the war. Hartman was not so lucky. An eyewitness account by another pilot described the moment his P-47 was attacked by German aircraft returning from a mission over La Rochelle, France, in January 1944: "I made another 360 degree tight turn at 9,000ft and saw Lt Hartman's ship going down in a wide spiral while two enemy aircraft circled around his plane. I could not see a 'chute. I looked back and observed a tall column of black smoke, which was probably Lt Hartman's ship burning." This photograph was taken by a USAAF airman, and may have been intended as a souvenir of what British rural life was like. Captured here, brandishing a meat saw poised over a leg joint, is William Glasscock. Raised on his family's farm before it folded, Glasscock became a delivery boy for T D Dennis as a teenager. During the war, he joined his local Home Guard unit and like 1.5 million other men too old or young for military service, spent his Sundays training to be the last line of defence in the event of a German invasion. Glasscock's teenage daughter, Pearl, worked beside him on his deliveries and his youngest son, Roger, would later work in the grocery shop next to T D Dennis. Image caption Repairing a P-47 Thunderbolt at Duxford, Cambridgeshire. 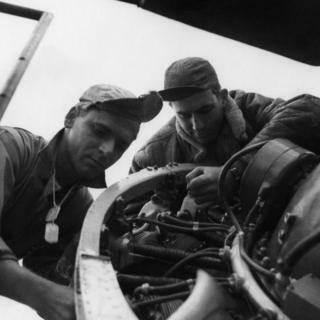 Ground crews were responsible for the routine maintenance of aircraft. They included general mechanics and specialists who repaired particular parts, such as instruments or armour. Servicing had to be regular and painstakingly thorough in order to keep equipment battle-ready and safe. The job could be both monotonous and highly pressured, with work going on around the clock. A ground crew generally worked on the same aircraft and might feel a sense of ownership for it, just as an aircrew often did. Reifeiss came from Missouri, and Taylor from Oklahoma. Like many young men in the army, they probably had not travelled outside of their home state before the war, and would have been expected to live similar lives to their fathers. Reifeiss had just begun to work as an office clerk for a wholesale hardware firm like his father Otto, and Taylor was employed on the family farm. Hill lived in Texas all of her life and worked for more than 30 years as a book-keeper for the Baptist General Convention of Texas. The war brought an interruption to her career when she volunteered as part of Dallas's civil defence and then when she enlisted in the Women's Army Corps - a decision at which her boss "nearly flipped". Hill served overseas for 27 months, not only in England, but in France, the Rhineland and Central Europe. After retirement she spent time fishing at the lakeside cottage she owned with her sister. Hill's nephew Don remembers her as "an avid birder … [who] loved to go fishing. She was a quiet woman… [who] smiled often, with a kind nature." All photographs © Imperial War Museum from the book, Somewhere in England, published to coincide with the reopening of IWM Duxford's American Air Museum. Some of the stories from the book will feature in the newly transformed hangar that reopens on 19 March and you can find out more about the Roger Freeman collection on its website.